Your press shop is likely under considerable pressure to reduce the cost of the products (stampings) produced. One stampers reduce their costs is to increase stamping-press efficiency—produce more parts/hr. But before a plant manager turns up the speed dial on his presses, he must consider and understand the effect such a move can have on the overall process. For example, punching and cutting at higher press speeds imparts higher impact forces on punch faces and higher snapthrough forces (reverse tonnage) on the punch heads. Impact occurs when a punch first makes contact with the part material. The punch’s travel stops briefly as backlash and deflections in the ram and press are absorbed. Compressive loads build rapidly, sending a shock wave up through the punch, and the part material begins to deform. With conventional punch-to-die clearance (5 to 8 percent/side), the part material bulges from under the punch face as it compresses into the die matrix. When the tensile load exceeds the shear strength limit of the part material, the punch cuts through the material until the slug suddenly separates. This sudden unloading of pressure on the punch generates a reverse shock that can break punch heads. At the same time, the pierced hole closes up tightly around the punch point. The compressed slug springs back and is held tightly in the die matrix. 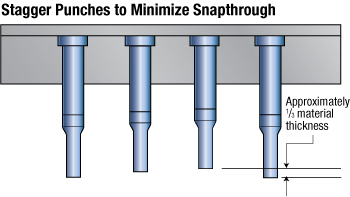 To help minimize impact and snapthrough forces, stampers can stagger punches in length. Using two or three different punch lengths can reduce loads by 30 to 50 percent. A common practice is to stagger the different groups of punches by an amount equal to stock thickness. A better alternative: Stagger punch lengths equal to the shear band width being cut, typically one-third stock thickness (see figure). This allows the next group of punches to contact the part material prior to the first group snapping through. The snapthrough energy from the first group of punches is absorbed and used to drive the next set of punches through the workpiece. Using the shear band width instead of material thickness is particularly important in higher-speed stamping applications, because it minimizes punch entry and helps to minimize punch wear. And, because the punches withdraw from the stock strip sooner, additional time is gained for stock feeding. Significant improvements in life expectancy can be realized as punch-to-die clearances increase. These engineered clearances—typically 10 percent per side or more—minimize burr height while increasing tool life. When using engineered clearances, the part material stretches across the punch face, placing the material in tension. When the slug fractures, the hole becomes slightly larger than the punch-point diameter. This can reduce abrasive wear by as much as 65 percent compared to using traditional clearances. The negative effect of using engineered clearances: the slug remains loose in the die matrix, which can lead to slug pulling. To avoid this scenario, use a spring loaded ejector pin extending through the center of the punch face, and be sure to use proper shear angles. Punching small-diameter holes at high press speeds will require special attention to tool-steel selection. As speed increases so does the amount of heat generated. At the same time, the length of time that the tooling contacts the workpiece decreases, reducing the amount of cooling afforded by the tooling. Because small punches have even less ability to dissipate heat, they are prone to overheating. This can result in a loss of hardness, reduced wear resistance and dimensional instability. High-speed or high-alloy tool steels, such as M2 and PM-10V, are tempered at temperatures above 1000 F, giving them temper resistance superior to A2 and D2 in high-speed applications. Consider two identical stamping presses operating at the same average slide velocity—20 ft./min., for example. We’ll also assume one of the upper dies (A) has twice the mass (1000 lb.) of the other (B, 500 lb. ), or A = 2B. Here, kinetic energy increases proportionally with the square of its speed. When press speed doubles, kinetic energy quadruples. Some of the kinetic energy from the press will be transferred and expended in the form of mechanical energy to deform the sheet into a stamping—a desirable result. However, some of the energy will be transformed into less-desirable energy states such as heat, dynamic deflections and vibration associated with impact force transferred into the press frame. Stampers must understand and control the increased kinetic energy and impact vibrations associated with higher-speed stamping operations in order to prevent damage to the tooling and the press. Depending on the magnitude of inertia forces and the rigidity of the machine design, the pitman will elongate, effectively reducing shut height. This shut-height reduction introduces additional stresses, including impacting the large end of the pitman on the crank journal and introducing additional frame deflections. Material fracture during punching and cutting also can create higher snapthrough forces, and transfer additional kinetic impact energy into the frame structure in the form of vibrations. As press speeds increase, there is less time to dissipate these vibrations and they eventually can reach critical levels. This is where a stamper begins to experience nuisance problems such as nuts and bolts loosening, and catastrophic problems such as crankshaft and tie-rod breakage.